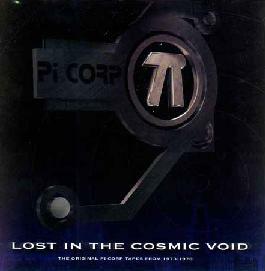 PI Corp - "Lost In The Cosmic Void"
PI Corp were a group of stoned space adventurers and while this is not greatly recorded it does capture the unique stoned space that these cats created. These guys were truly lost in the Cosmic Void. The band existed in Cleveland from 1973-76. Rockadelic contacted the band and this was released as a limited edition of 500 copies in 2001. All the tracks except for 2 were recorded live in one take. The LP begins with the Dirge, which has some strange electronics with backwards effects. Drumola has some laughing voices as the space organ and voyage begins. Together begins with some phased out drums and a real mellow space journey evolves with some really cool electronics at the end. Devil Weed is a trippy track with loud drums and strange voices and a dark brooding mood as it builds up. Just Another Song ends the side with another mellow space trip! Side B starts with LSD1 and some cool flute and electronics as well as spoken word as the bass line builds and we slide out into space once again. All the journeys are far too short. I am sure these guys must have made some long spaced out jams at some point but only short snippets are captured on this record. Shiiit is a song with some Pink Floyd guitar. One of the few songs to prominently feature guitar. Telerama Boogie starts with echoy voices and drums as the electronic buzz filters over the top and then it ends. Short! Organ Over Easy ends the record and is the closest thing to a rock song on the record and is driven by a spacey organ lead. It is a tripped out record. Enjoy. For more information you can visit the Rockadelic Records web site at: http://www.rockadelic.com. Nasoni Records appears to have the last known copies of this record so please contact them if you are interested through their web site at: http://www.nasoni-records.com.